Oops… Prey’s Flux Capacitor needs tinkering. Hi, Jerry! We’ve noticed your computer DESKTOP-BGR2B7C had trouble updating Prey automatically. This has been fixed in the latest update (1.8.2). Affected devices require a manual Flux Capacitor fix... I mean... Application update. Older Prey versions continue to work, but their functionalities might be stuck in the past. 2- Enter the Downloads tab and select the device’s OS. 3- Reinstall Prey and log in using your credentials. 4- Order pizza, you deserve it. That is most of the email. My internet was slow yesterday so when Prey asked me if it could first uninstall the current version and I said yes, there was an issue with a download - I assume the download for the new version. I just tried again now. It is now saying it cannot uninstall the old version. Hit the Windows + the R keys on the device at the same. On that little prompt type services.msc and hit Enter. Look for Cron Service and right-click on it to check its Properties. So I seem to be stuck. Can anyone help? You can just download the new version and just over-install it, the process is going to remove the previous version and install the new one. Try that and let me know how it went. Javo, can you please be more specific on how to over-install the old one? Specifically, if I go to Prey, hit Get Prey Now, click on Basic Free, and choose Windows 64 bit, Prey asks to proceed to uninstall the old version. As soon as I hit that, it then says cannot proceed with the update and to make sure the Prey folder is removed. And again, there is no Prey folder. Is there a C:\Windows\Prey directory? If you have it can I have a picture of the files inside it? 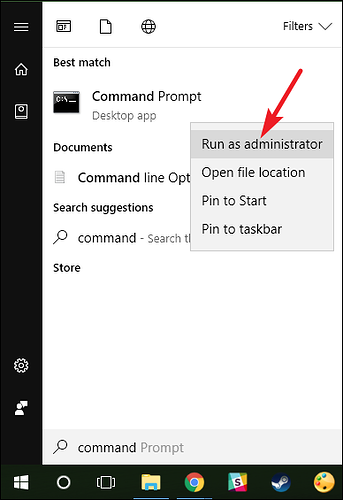 However, today instead of using Cortana to search I used the Run command. And I did find a folder. Should I just delete that folder? Yeah, like that, is the name of the user you were logged in when you installed Prey. You then replied, "Yeah, like that"
So nothing more with that? We are getting nowhere fast it seems. As I told you before, I wanted to see the prey_install.log and prey_uninstall.log located on your C:\Users\Jerry D. Magill\AppData\Local\Temp, I just assumed that you read the previous posts. When i say Run I meant in your Command Prompt! Ok, what about the C:\Users\Jerry D. Magill\AppData\Local\Temp\prey_install.log and C:\Users\Jerry D. Magill\AppData\Local\Temp\prey_uninstall.logfiles? Can you paste them here? and enter both those (one at a time) in the command prompt. Microsoft Windows Version 10.0.17134.407 2018 Microsoft Corporation. All rights reserved. C:\WINDOWS\system32>The system cannot find the path specified. I just tried to install Prey again. I got the same thing. Prey is already installed. AND. Yikes, something went wrong. Hi Javier. Should I look for another way to protect my laptop and phone?